Media captionTrump: "US military is ready if necessary"
He said it was possible a meeting could still take place but warned North Korea against committing "foolish" acts. The meeting would have discussed ways of denuclearising the Korean peninsula, building on a historic North-South Korea summit in April. The "unexpected" decision, Pyongyang said, was "extremely regrettable". In a statement released by the North's central news agency, Vice-Foreign Minister Kim Kye Gwan said the country held Mr Trump's efforts to hold a summit "in high regards". "We tell the United States once more that we are open to resolving problems at any time in any way," he said. But even before the US president's announcement, doubts had emerged on both sides about whether the talks would take place. Mr Trump's statement marks a fresh twist in the turbulent relationship between him and Mr Kim. Last year saw the two exchange lurid insults and mutual threats of annihilation. This year though has seen warmer relations. 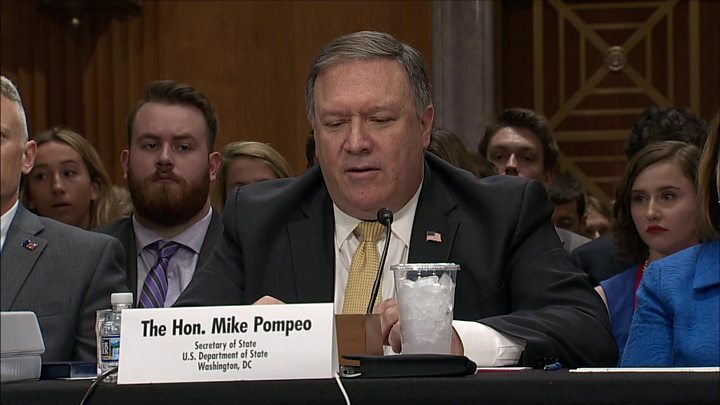 In the build up to the meeting, as a goodwill gesture, North Korea released three Americans it had in prison..
North Korea had also dismantled tunnels at its only nuclear test site only hours before Mr Trump's announcement. What does Kim Jong-un really want? A senior administration official later gave more details about the summit's cancellation, saying North Korea showed "a profound lack of good faith" in the run-up to the meeting. There were a series of "broken promises" from Pyongyang, the official told reporters, including when the White House sent the deputy chief of staff to Singapore to meet North Korean diplomats ahead of the summit. "The North Koreans didn't show up. They simply stood us up." 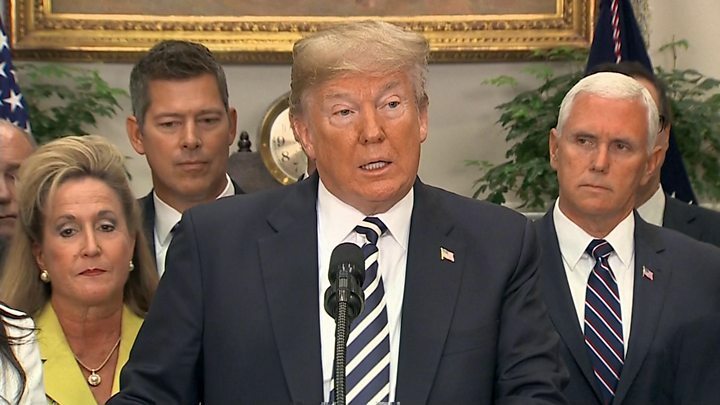 The official also said President Trump had "dictated every word" of the letter to Kim Jong-un after talking with South Korean President Moon Jae-in. The meeting - in Singapore on 12 June - would have been the first time a sitting US president met a North Korean leader. The Trump administration insists that North Korea was not responding sufficiently in the summit preparations, raising doubts that the meeting would be able to achieve a positive outcome. The big question is what happens now? Prior to the thaw in relations between North and South Korea that began the process that led to the summit date, wild rhetoric was being exchanged between Pyongyang and Washington raising serious fears of a renewed conflict on the Korean Peninsula. Will North Korea now resume its long-range ballistic missile testing? Will the war of words be renewed? Or might there be a slim chance of some kind of diplomatic process being maintained? And finally, can relations between North and South Korea be insulated in any way from the growing tensions between Pyongyang and Washington? Mr Trump said he had been "very much looking forward" to meeting Mr Kim. "Sadly, based on the tremendous anger and open hostility displayed in your most recent statement, I feel it is inappropriate, at this time, to have the long-planned meeting," Mr Trump said in a letter to Mr Kim. But he called the meeting a "missed opportunity", saying "someday, I look very much forward to meeting you". Mr Trump was apparently responding to statements from North Korea attacking his administration and casting doubt over the meeting. Ms Choe, who has been involved in several diplomatic interactions with the US over the past decade, said the North would not "beg" for dialogue and warned of a "nuclear showdown" if diplomacy failed. References to Libya have angered North Korea. There, former leader Colonel Gaddafi gave up his nuclear programme only for him to be killed by Western-backed rebels a few years later. South Korean President Moon Jae-in said he was "very perplexed and it is very regrettable that the North Korea-US summit will not be held", the Yonhap agency reported. It was South Korean officials who first informed the US that Mr Kim was prepared to discuss potential nuclear disarmament. 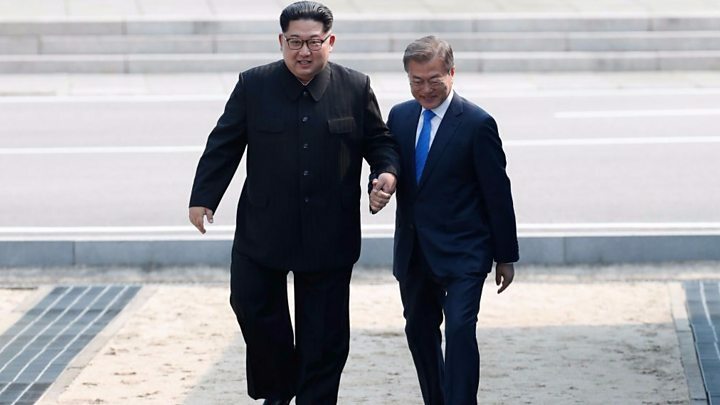 In April, the leaders of both Koreas had a historic meeting at the border, promising to end hostilities and work towards a denuclearisation of the Korea peninsula. UN Secretary General Antonio Guterres said the US and North Korea should not give up, saying "nerves of steel" were required. In the US, Republican Senator Tom Cotton praised President Trump for "seeing through Kim Jong-un's fraud". But Democratic Senator Brian Schatz said the move was what happened "when amateurs are combined with warmongers".